Despite the recent economic whiplashes that forced millions of people to loose their jobs in a variety of industries that were once considered safe and vibrant, only one industry has stood the test of time and weathered the storms of these harsh economic conditions. The medical industry still provides one of the most economically immune job opportunities in virtually all its sectors, and cardiovascular technologist is one of them. With more and more people leading a sedentary lifestyle and consistently worrying about their heart conditions, there is definitely a growing demand for all professionals in heart or cardiology field. It is true that pursuing a career as a professional cardiovascular technologist, has the potential to provide one with not only a safe and financially rewarding career opportunity, but can also unlock one's potential in genuinely helping other people to get better at the time of their most need. While the word sonography itself might be new for some people, it is a fact that sonography has been around for quite a while in the medical profession especially when great advancements in medical technology started taking place. Sonography is a very broad medical field with many areas of specialization, and can generally be described as seeing with sound. It involves the use of special medical equipment to direct high frequency sound waves to various parts of the body with the main aim of diagnosing any cardiovascular or heart conditions. This equipment collects all the echoes and then forms images that are transmitted, photographed or even videotaped for purposes of diagnosing all kinds of heart defects or cardiovascular conditions. A cardiac ultrasonographer is trained to handle this equipment and develop the relevant skills and techniques required for success in this industry. Apart from just being in the healthcare and medical fields, the demand for cardiac sonography is scheduled to rise tremendously because it is considered much more safer in diagnostics than the traditional radiology technology procedures that came before it. In fact, with the discovery of 3D technology, cardiac ultrasonography is predicted to further increase in demand as new techniques are expected to evolve, and give birth to new ultrasound procedures like 3D-ultrasonography. The average salary in USA is approximated to be $65,800, AU$84,700 in Australia and CAD$60,000 in Canada (read more here). 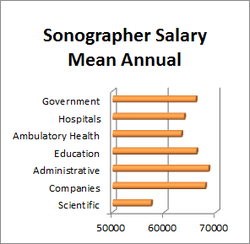 These figures often vary or range from city to to city and also depending on the level of education acquired by the cardiovascular sonographer and their experience in the field. A cardiovascular sonographer is expected to acquire a decent amount of knowledge in human anatomy and physiology, and a completion of several clinical training programs. The job also requires great communication and interpersonal skills, analytic aptitude in addition a seamless maneuvering when handling the equipment in question. One will need to complete at least a two-year associate degree to enter the career, and several community colleges, vocational schools and technical schools as well, offer degree programs in this field with each of them having their own choice of books. Pursuing a bachelors degree and getting certified, is definitely bound to increase one's pay scale as well as open doors for more opportunities than people with just an associate degree.